Construction volume in the Euroconstruct area has grown by an estimated 3.5 % in 2017. The strongest stimuli once again came from residential construction. Developments in 2017 are remarkable for two reasons: Firstly, growth in construction measures in Europe reached its highest level since 2006, that is shortly before the outbreak of the international financial crisis. Secondly, construction demand rose in all 19 member countries in 2017. This is the first time that growth has been seen across the board in Europe since Germany’s reunification; and it looks like this feat will be repeated in 2018. 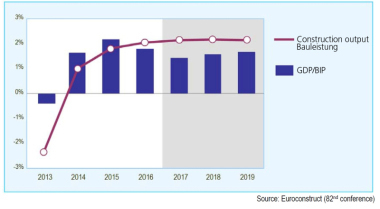 The European construction industry has now been on track for growth since 2014. Construction output in the four years from 2014 to 2017 has increased by a total of 9 %. A further increase of 6 % can be expected in the 19 Euroconstruct member states by 2020. Growth rates will slow considerably in the future in both residential construction and non-residential construction, while civil engineering will take over the role of market driver in the medium term. The latter is also expected to grow at the unprecedented rate of over 4 % in 2018 and 2019 respectively. At the same time, the newbuild segment will clearly lose momentum in the years ahead. By 2020 the renovation sector is expected to see stronger growth than new construction for the first time since 2014. 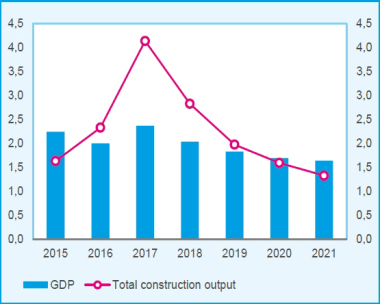 The favourable development in construction demand is partly due to robust economic growth and its positive implications for household income, corporate profits and the state of public finances. Moreover, the low interest rate level, immigration and internal migration flows, as well as the investment backlog that has accumulated in areas like infrastructure since the financial crisis is supporting the upswing. There are also clear constraints on the public sector’s scope to take action. This is reflected in the cautious approach to taxation and/or the subsidy policy adopted by many European countries. In some places high vacancy rates and/or excessively high real-estate prices are also preventing a stronger upturn in construction activity. In 2017, construction demand is expected to be strongest in Hungary – the second smallest market in the Euroconstruct area – with a plus of 25 %, followed by Ireland (15 %), Sweden (10 %), and Poland (9 %). Hungary will also post the highest growth rates for the next three years through 2020 (+33 %). In addition to state subsidies for residential construction, the more consistent use of EU funds especially for civil engineering will play an important role here. In second place comes Ireland (28 %), followed by Poland (25 %), the Czech Republic and Portugal (15 % respectively). 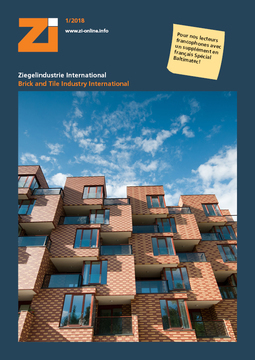 In Germany construction activity in 2017 even increased more strongly than in 2016, driven by higher demand for residential accommodation, a greater willingness to invest on the part of companies and a civil engineering drive by the German government. Although growth will slow down significantly in the mid-term, investment in both the residential and the infrastructure segments is expected to be high in the long term.